The attic over the garage or under a low gable is frequently pressed into service for closet storage. Unfortunately, attic spaces are often fraught with difficulties due to sloped and slanted walls or low ceilings. However, challenges like these can lead to triumpth under the skilled hands of the Closet Works design team. This attic closet was no exception and the room presented several difficulties that were successfully overcome during its transformation into the perfect master closet. The uniqueness of the space presented a number challenges. The amount of wall space with a right angle to the floor is limited to a small area of space at the front of the gable. Closetworks installed a bank of three drawers, each outfitted with drawer organizers for lingerie and wardrobe accessories, in this space. What appears to be a fourth drawer is actually a tilt-out hamper to keep dirty laundry out of sight. The side walls of the room slope all the way down to the floor. Hanging rods were installed along part of these walls on both sides and are a good solution for this odd shaped space, however, shelving was also incorporated for shoes and folded items. The countertop above the low shelves wraps partially behind the shoe shelves, eliminating dead space. A white laminate finish was selected for the base of the system, plus the drawers and shelving. A contrasting countertop in Cocoa laminate personalizes the look, giving the room a custom feel. Keeping the countertop height relatively low opens the space visually, increasing the floor space and eliminating the claustrophobic feeling that often comes with a low ceiling. The overall effect is clean, efficient and inviting. It provides all the space needed for this homeowners belongings so that the room need never feel cluttered. 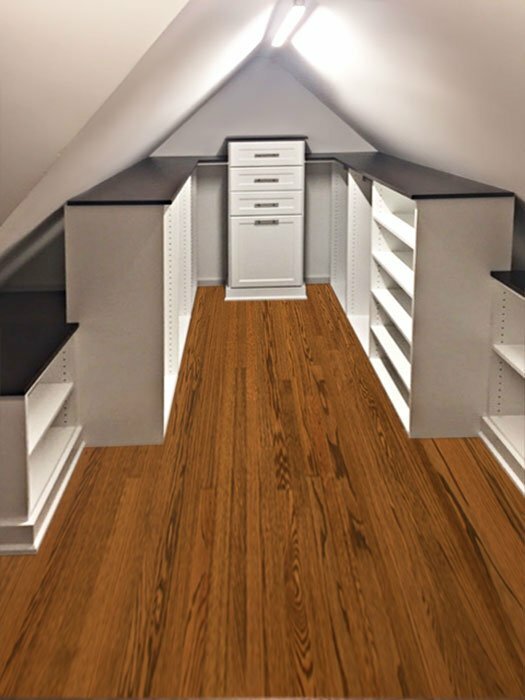 Custom closet storage system for attic room with slanted walls and low, sloped ceilings.